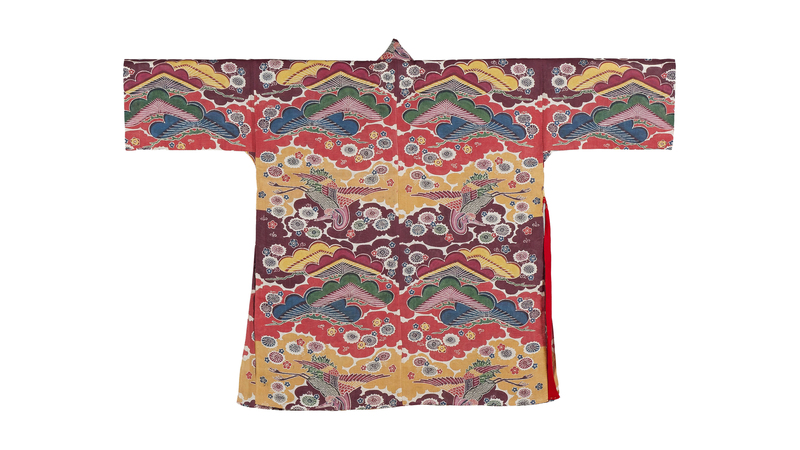 Okinawa, Japan’s southernmost prefecture, was an independent kingdom until 1879, with its own language, culture, and distinctive textile traditions. 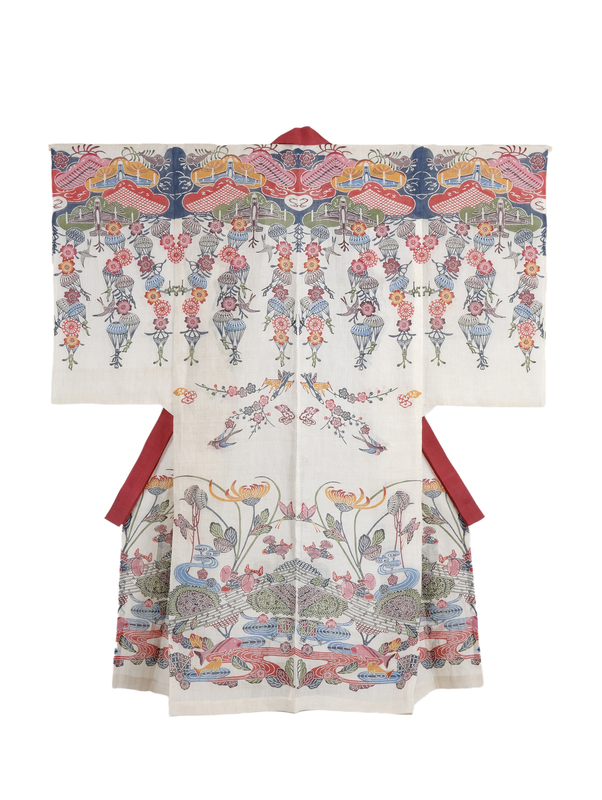 This special showing of textile treasures from Okinawan museum collections features brightly colored bingata—traditional resist-dyed fabrics—and contemporary works by Okinawan artists and fashion designers. Organized in partnership with the Okinawa Prefectural Government. Major grant support for this exhibition was provided by the Coby Foundation, Ltd., and the E. Rhodes and Leona B. Carpenter Foundation. Yuko Tamanaha, watansu with clouds, Chinese phoenix, pine, wisteria, sparrows, bamboo, and peonies on a yellow ground, 2014. Okinawa Prefectural Museum and Art Museum. 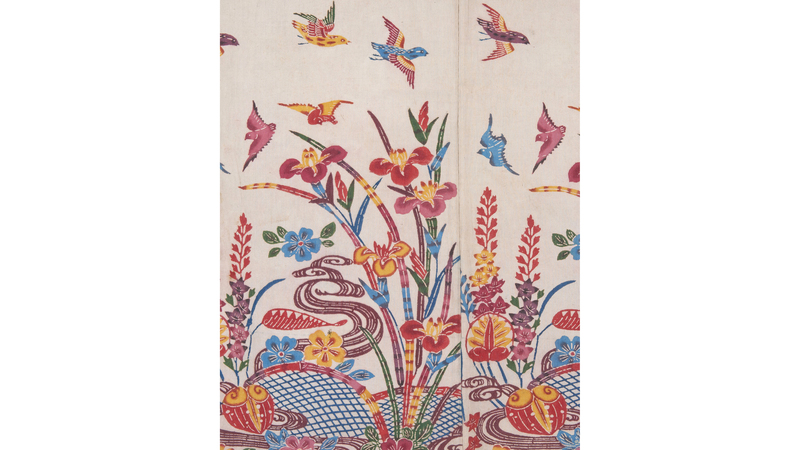 Yuko Tamanaha, detail of watansu with clouds, Chinese phoenix, pine, wisteria, sparrows, bamboo, and peonies on a yellow ground, 2014. Okinawa Prefectural Museum and Art Museum. 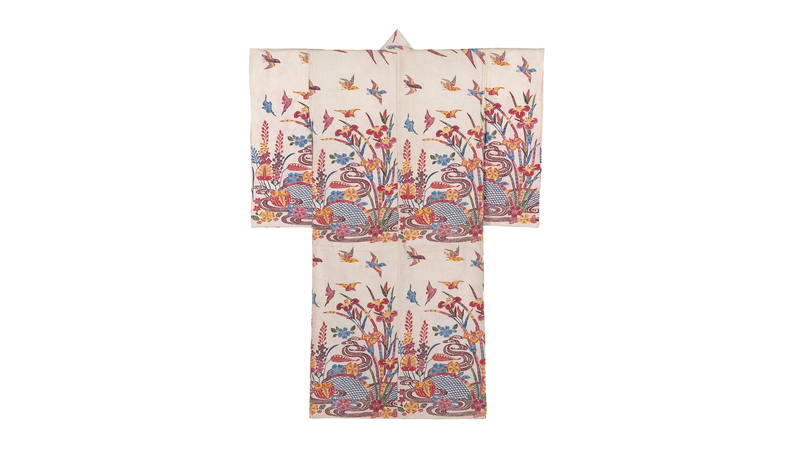 Woman’s robe with pine bark, chrysanthemum, wisteria, swallows, mountains, and flowing water on an aqua ground. Shuri, Okinawa, 19th century. 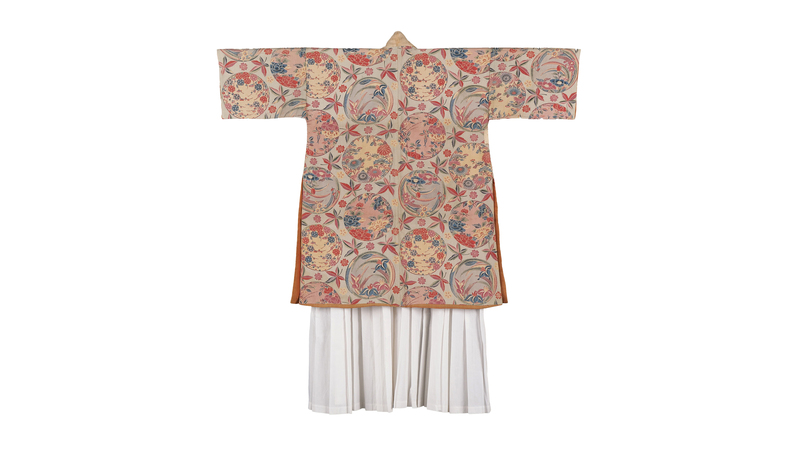 Private collection (on loan to the Okinawa Prefectural Museum and Art Museum). 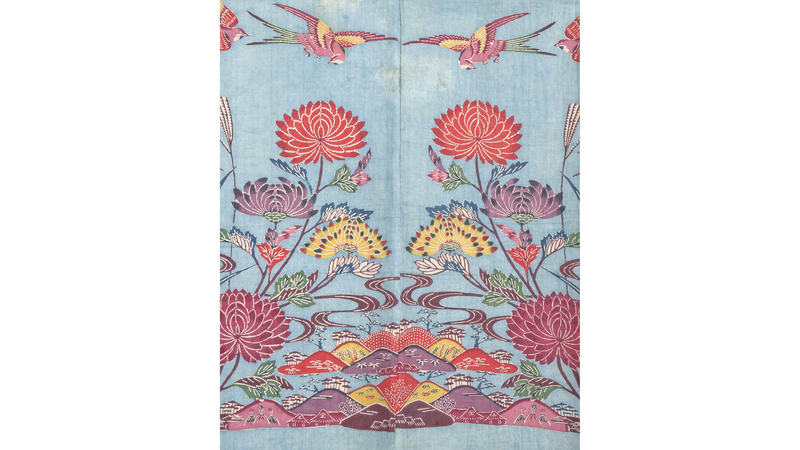 Detail of woman’s robe with pine bark, chrysanthemum, wisteria, swallows, mountains, and flowing water on an aqua ground. Shuri, Okinawa, 19th century. 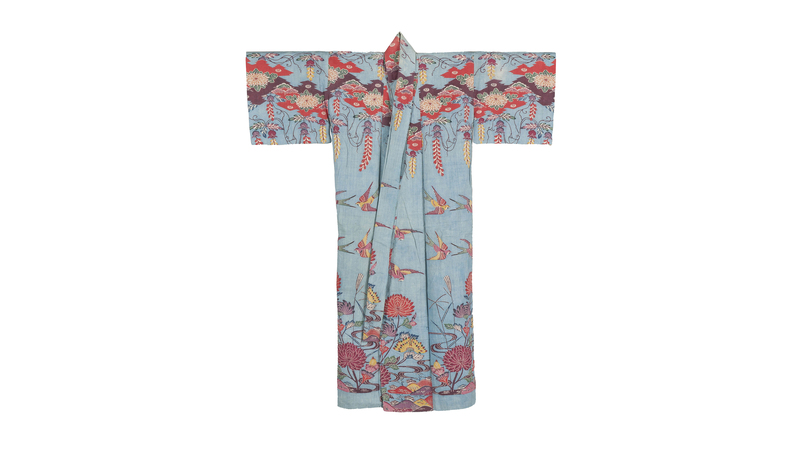 Private collection (on loan to the Okinawa Prefectural Museum and Art Museum). 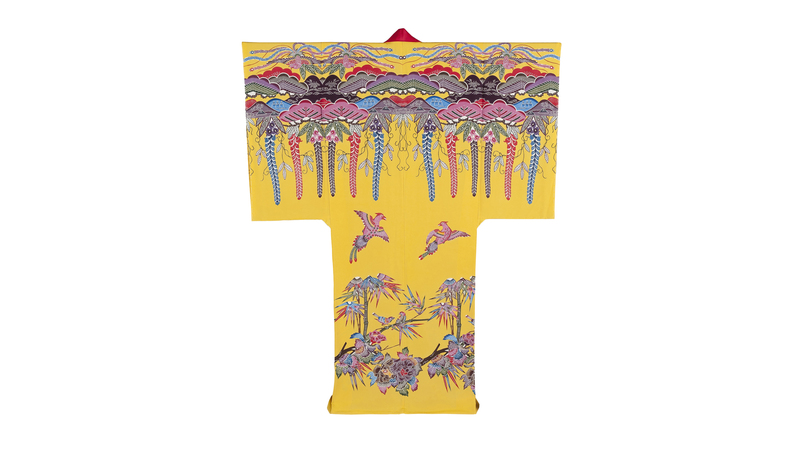 Watansu with plum and cherry blossoms, maple leaves, snowflakes, and handballs on a yellow ground. Shuri, Okinawa, 19th century. Okinawa Churashima Foundation. Detail of watansu with plum and cherry blossoms, maple leaves, snowflakes, and handballs on a yellow ground. Shuri, Okinawa, 19th century. Okinawa Churashima Foundation. 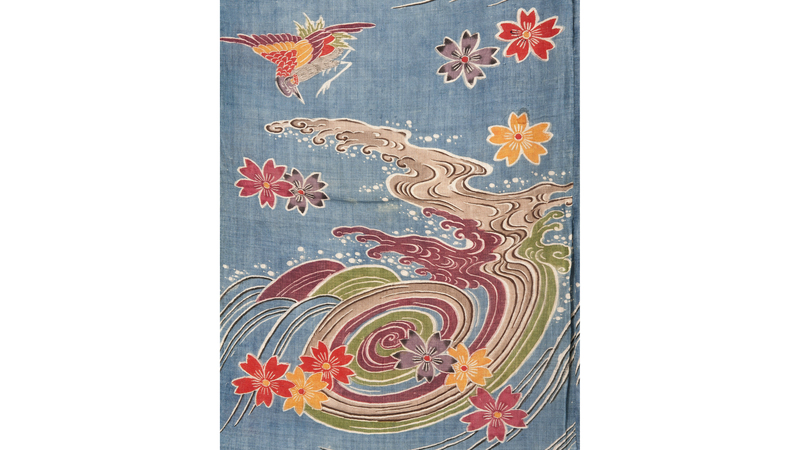 Tanashi with waves, cranes, and cherry blossoms on a light indigo ground. Naha, Okinawa, 18th–19th century. Naha City Museum of History. 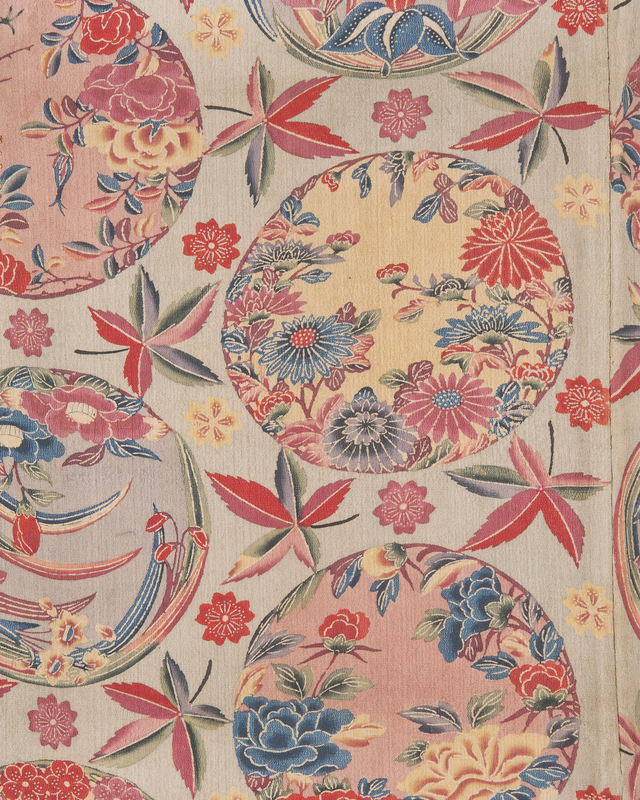 Detail of tanashi with waves, cranes, and cherry blossoms on a light indigo ground. Naha, Okinawa, 18th–19th century. Naha City Museum of History. 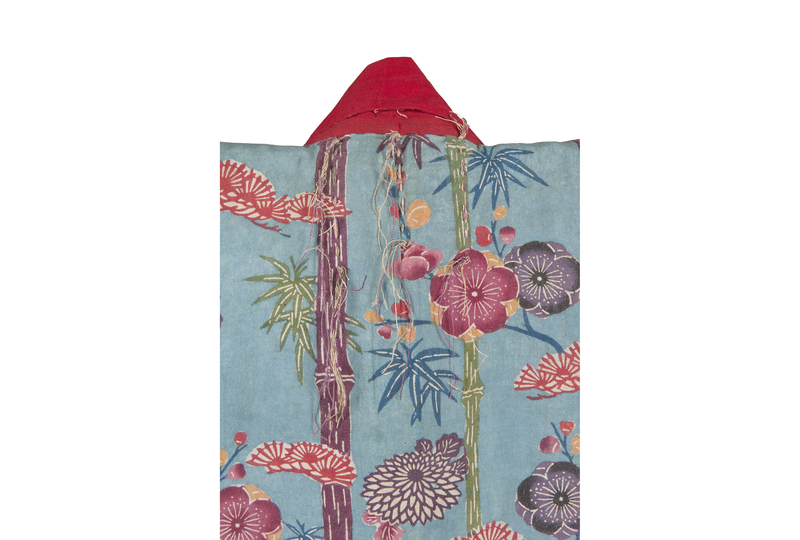 Child’s costume with pine, bamboo, plum blossoms, and chrysanthemums on a light indigo ground. Shuri, Okinawa, 19th century. Okinawa Churashima Foundation. 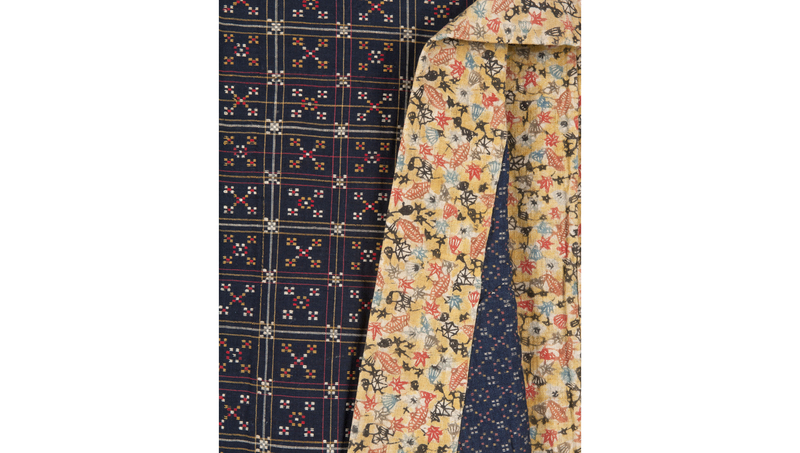 Detail of child’s costume with pine, bamboo, plum blossoms, and chrysanthemums on a light indigo ground. Shuri, Okinawa, 19th century. Okinawa Churashima Foundation. 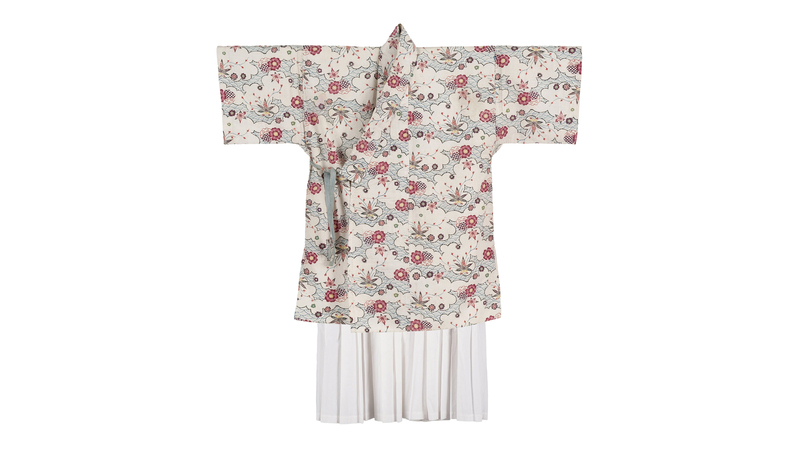 Child’s costume with flowing water, gabions, iris, and birds on a white ground. Shuri, Okinawa, 19th century. Okinawa Prefectural Museum and Art Museum. Detail of child's costume with flowing water, gabions, iris, and birds on a white ground. Shuri, Okinawa, 19th century. Okinawa Prefectural Museum and Art Museum. 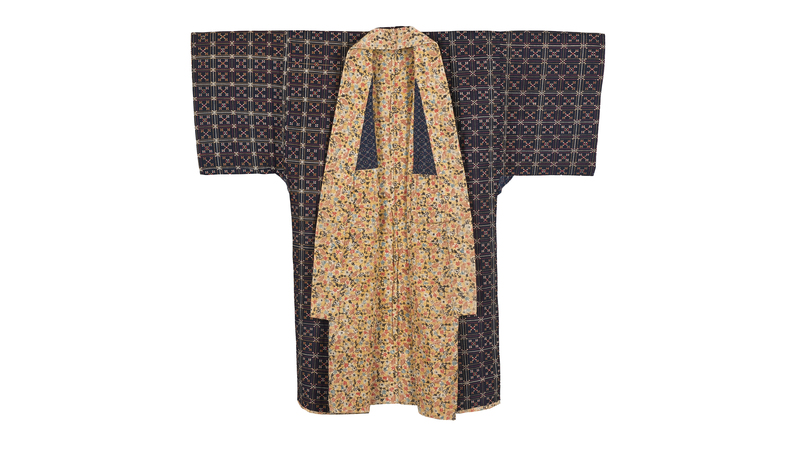 Watajin attributed to Shuri (lining) and Yuntanza (outer fabric), 19th century. Okinawa Prefectural Museum and Art Museum. 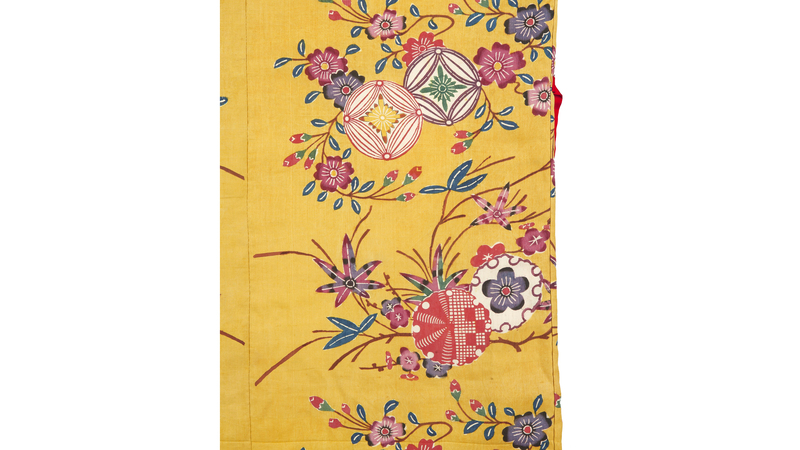 Detail of watajin attributed to Shuri (lining) and Yuntanza (outer fabric), 19th century. Okinawa Prefectural Museum and Art Museum. 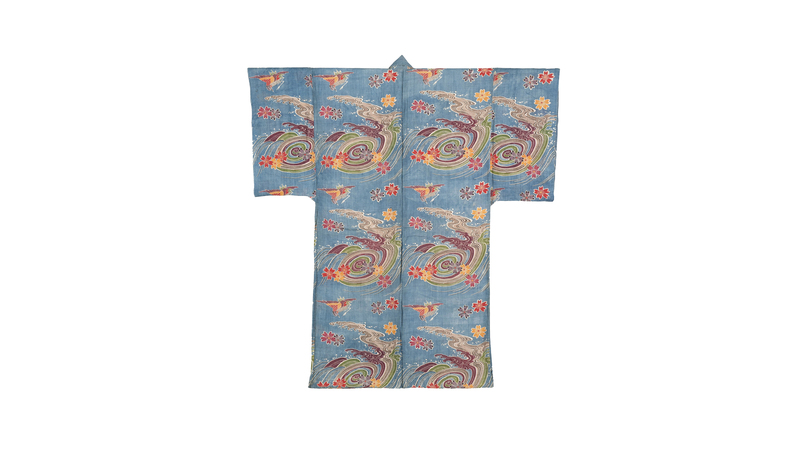 Dujin (inner robe) with clouds, waves, cherry blossoms, and maple leaves on a white ground. Naha, Okinawa, 18th–19th century. Naha City Museum of History. 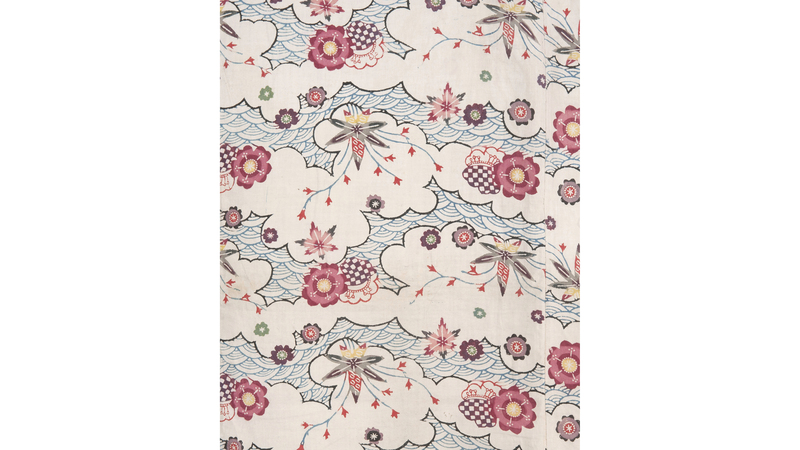 Detail of dujin (inner robe) with clouds, waves, cherry blossoms, and maple leaves on a white ground. Naha, Okinawa, 18th–19th century. Naha City Museum of History. 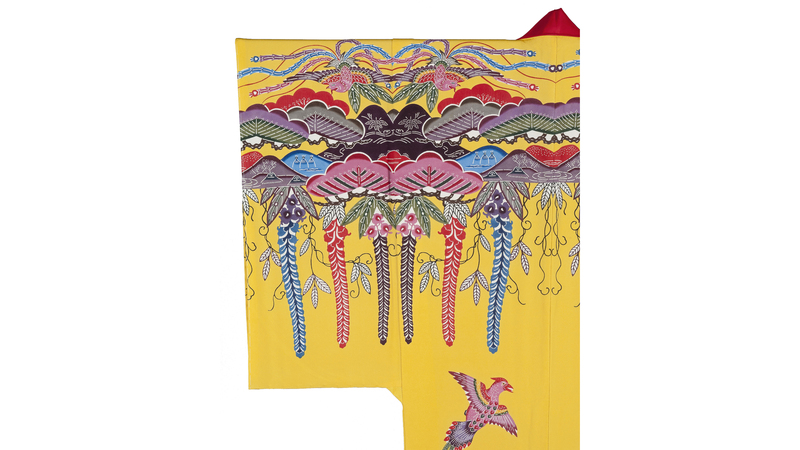 Dujin (inner robe) with cranes, pine, plum blossoms, and chrysanthemums on a multicolor ground. Shuri, Okinawa, 19th century. Okinawa Churashima Foundation. 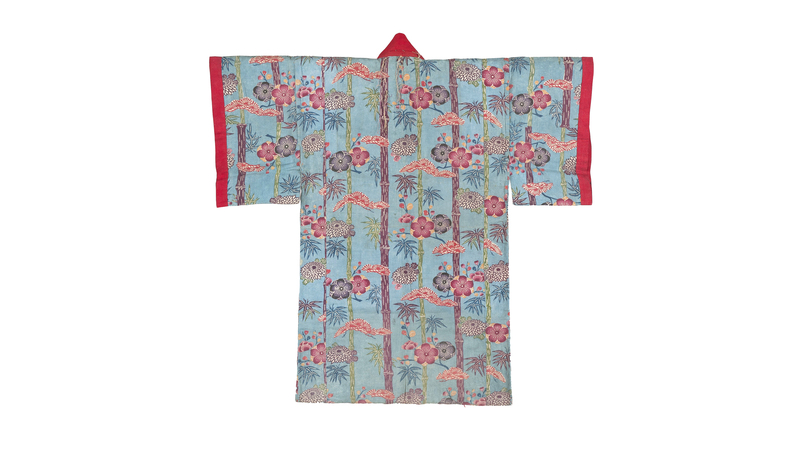 Dujin (inner robe) with scattered cherry blossoms and maple leaves on a light aqua ground. Shuri, Okinawa, 19th century. Okinawa Prefectural Museum and Art Museum. Detail of dujin (inner robe) with scattered cherry blossoms and maple leaves on a light aqua ground. Shuri, Okinawa, 19th century. Okinawa Prefectural Museum and Art Museum. 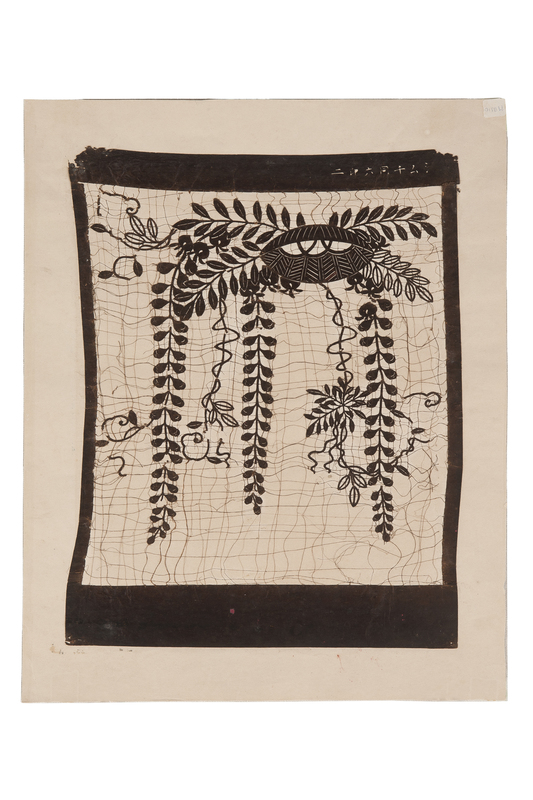 Shirujigata (negative stencil) depicting kasa cap and wisteria patterns. Shuri, Okinawa, 1867. Okinawa Prefectural Museum and Art Museum. 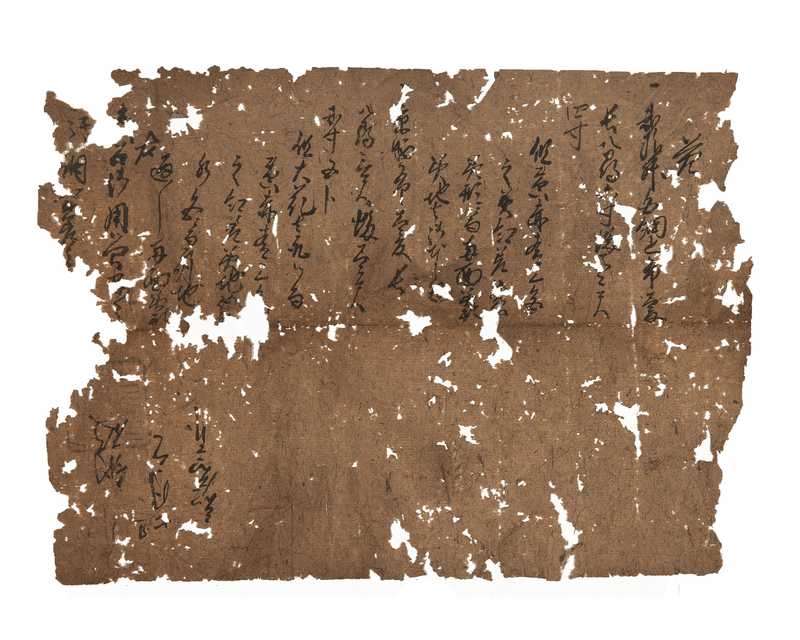 Order document from the treasury of the royal court to Chinen Chikudun Pe-chin (court official in charge of dyeing textiles). Shuri, Okinawa, 19th century. Okinawa Prefectural Museum and Art Museum. 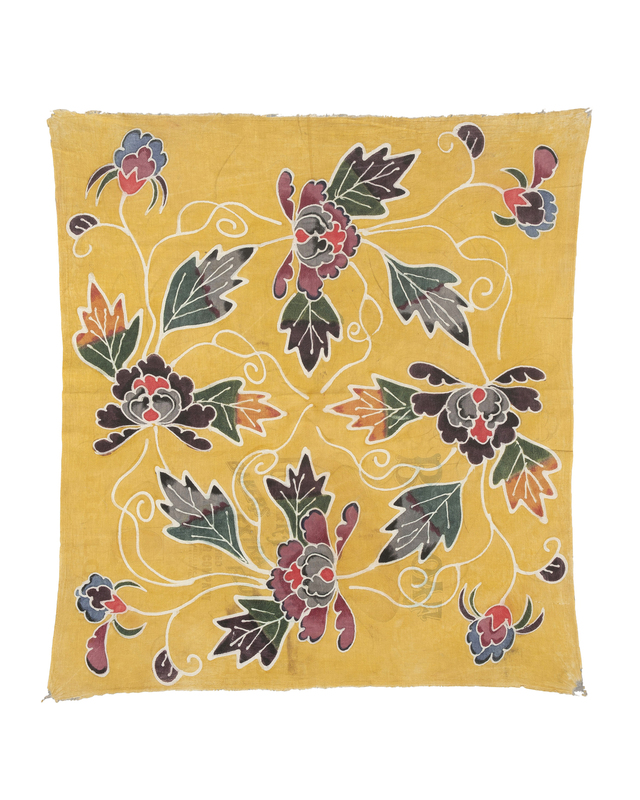 Uchukuii with peonies on a yellow ground, Okinawa, 1950s. Okinawa Prefectural Museum and Art Museum. Yuken Teruya, Yu-I, Yu-I, New York, 2002–05, Ramie. Okinawa Prefectural Museum and Art Museum. 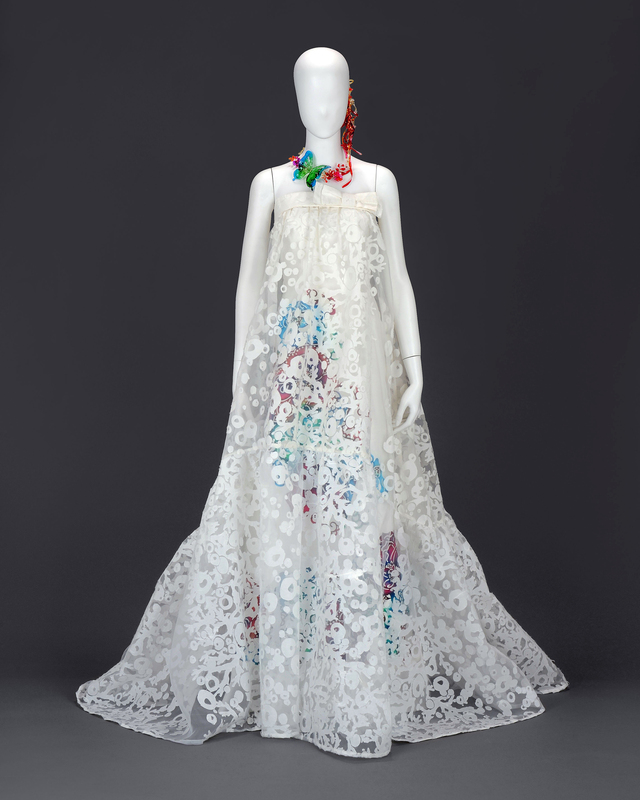 Kanna Yamauchi, wedding dress, Naha, Okinawa, 2015. Collection of the artist.